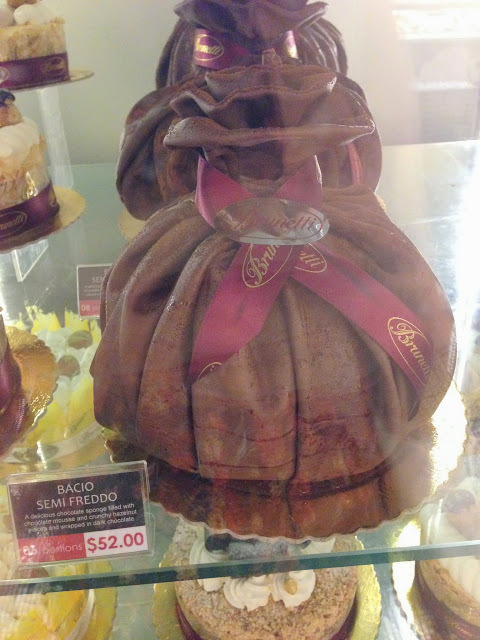 First visited Brunetti when they just opened and while the stuff were pretty okay, it didn’t leave a deep impression. This time I went totally at whim on a Sunday and their pastry case looked really impressive! Quickly ordered a small cup of Pistachio Gelato because I was starving and it was really good. Packed with the nutty goodness of roasted pistachios- though not as great as Alfero’s- without the off-putting taste of almond/pistachio extract. The texture also ticked all the right boxes. 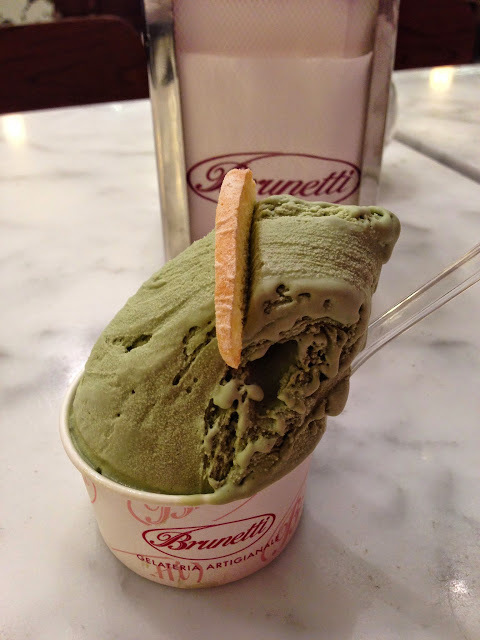 Smooth, thick, slightly dense and sticky (which is, IMO, how gelato should be unlike ice cream). oh and my scoop had a couple of lovely roasted pistachios too ^^ If you see them scooping and they didn’t scoop up the stuff on top (this happened to me too many times), just be thick-skinned and ASK FOR IT. $6.50 for a small cup seemed quite pricey at first but I soon realised it was quite a ginormous scoop! I couldn’t resist trying their biscuits because they were laid out so nicely, and they looked so well-made. I have a soft spot for italian cookies. When we stayed at Venice I would visit the neighbourhood’s pasticceria for their fresh buttery cookies which were charged by weight for my sugar fix. 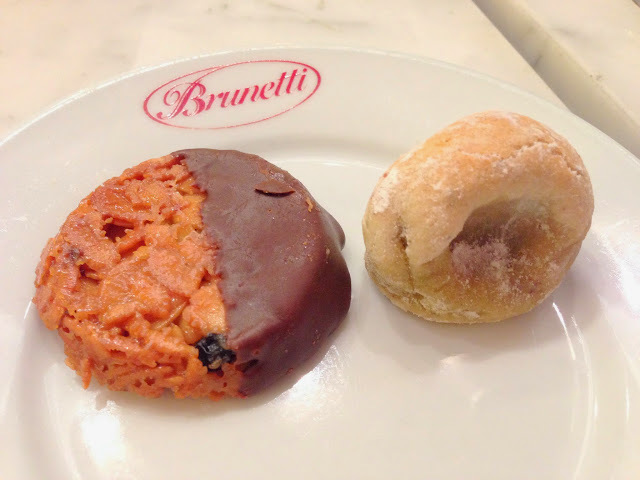 In Brunetti they have quite a wide variety ranging from flourless cookies (made of ground nuts like almond meal), shortbread, to florentines. I picked the flourless pistachio cookie, and the florentine. Don’t get the flourless cookies if you don’t like marzipan because that’s essentially, what they tasted like. I quite like the soft, slightly chewy texture of marzipan but it does have the taste of pistachio/almond extract which I know most don’t fancy (I’m fine with it but most places overdo it!). Their florentine was pretty delicious. Not too sweet, chewy (but it didn’t stick to my teeth) and well… almonds can’t taste bad! These went very well with my long black which tasted a little burnt but overall, still made for a good cup to accompany me through my light reading. Their whole cakes were gorgeous. They’ll made good centre pieces for parties!